Glitter. What kid doesn’t absolutely love the stuff? Even though your young artist may get a kick out of sprinkling the sparkly stuff around, it isn’t likely that you have the same oh-so positive feelings about the clean-up. When making glitter art with my own child (when he was younger) or kids that I’ve taught, I typically have them squeeze the glue out onto their papers and then sprinkle the sparkles on top. Shake off the excess and you’ve got a shining piece of art – and a major mess. So, I decided to simplify the process and just mix the glitter in with the glue. The kids can paint it on a piece of paper. The glue traps the glitter, meaning that you won’t have random sparkles popping up around your house, on your child or on you for the next few days. I started this activity thinking that I’d make a picture (I chose a flower, but your child can do anything that she wants). And then I stared exploring how it looked in a more abstract way. That’s when my 12-year-old son said (in that eye-rolling, super-disgruntled voice that only a middle schooler has), “Mom, what’s that supposed to be? It’s like, just a bunch of points.” I looked at the paper and realized that the glitter, caught in the glue, did in fact make just a bunch of points. It was pointillism, made uber-easy. 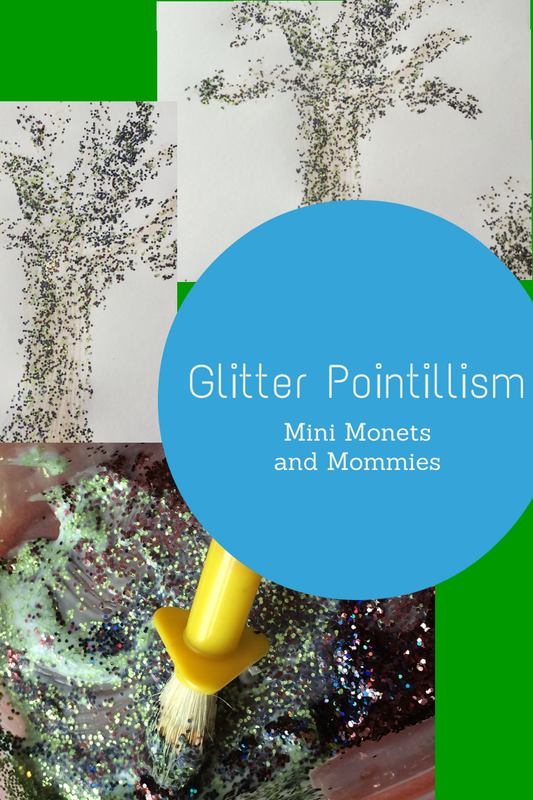 Before you begin, talk about pointillism with your child. Even tiny tots can learn the new word. Take a look at a work of art in the style in a book, online or visit your local museum (if they have pointillism art on display). Introduce her to famous pointillist painters such as Georges-Pierre Seurat and Paul Signac Instead of immediately pointing out the points, ask your child to tell you what she sees. Follow that up by asking how she thinks the artist made the painting. · Glitter- Choose at least three different colors. But, you can use more. · Plastic container – I reused the plastic tub that lunch meat comes in. 1. Pour a golf ball-sized pool of glue into the plastic container. 2. Sprinkle in the first color of glitter. Mix the glitter with the glue using a paintbrush. 3. Add more sparkles in different colors (one at a time). 4. Have your child decide what she wants to make. She can create “something” like a tree, or she can go with an abstract type of art. 5. Your child’s ready to “paint” with the mix. She can swirl the brush through the glitter-glue, and then paint on the sparkles. I love this idea with the glitter in the glue and no glitter all over the house. Thanks for sharing this idea on Merry Monday Link Party. Lovely idea, thanks for sharing with Small Victories Sunday linky. I've pinned to our linky board! Very creative! Thanks for sharing at the Thoughtful Spot Weekly Blog Hop! Glitters are very useful to make art beautiful. Many people are using glitters in art. They can get different colours of glitters. Children also like to use glitters. We can find dry and liquid glitters also. We can use dry glitters easily with brushes.